Hearts and Flowers, a photo by cathroff on Flickr. Hi, wet weather has kept us indoors this weekend. A good excuse to stay in my craft room! I used punches to make this card, which means, I used lots of snippets and left overs. Except for the red, I had to cut a strip from a new piece of card for the hearts! Spent ages looking for a scrap first though! So, I'm entering the Snippets Playground again over at Pixie's Crafty Workshop. It's great fun, shame when I have to pack up and go home! This will also be my 2nd entry into this month's challenge over at Scrapbook Boutique. If you live in Australia please join in. 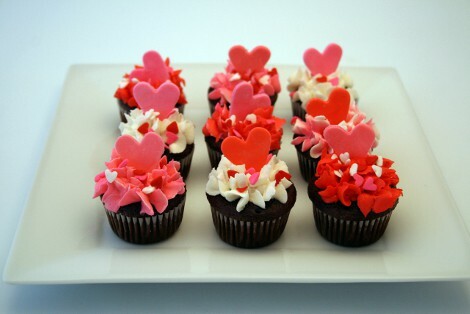 The theme is love and here is the delicious looking cupcake inspiration photo. Materials used: various punches; Stampin Up square lattice embossing folder; cardstock, bling & sentiment sticker from stash. This would have to be one of my 'all time' fave embossing folders (and grrrr I don't own it and only get to drool over it). What a wonderful card Cathy... you must live near me because it hasn't stopped raining for 2 weeks blaaaahhh. Thanks so much for sharing with us at Scrapbook Boutique this month! What a lovely card! The little squares of hearts and flowers look fabulous on that embossed background! Love the way the flowers shimmer! A beautiful card with fabulous embossing. Brilliant use of snippets. I love how precisely lined up everything is. Brilliant use of your snippets. What a lovely card! And great use of coloured snippets! ...and an awesome second entry in the SB challenge too Cathy! Wow all those little elements really pack a big punch - great job! I love this, Cathy! Into my CASE file it goes! Love the "rows" you created. Great card! So pretty, and so perfectly precise! Love the pops of color against your embossed white background. Your card with those devine little punched squares, shows it to perfection. Beautiful card, I'm so pleased you shared it with us at SBB this month.